The Western District of Hong Kong Island, generally defined as west of Aberdeen Street, was once referred to as an “old neighbourhood” in fast-growing Hong Kong. Whereas the adjacent Central District – the most historical commercial hub of the city – is constantly being renewed, areas such as Sheung Wan, Sai Ying Pun and Kennedy Town seemed to have stood still in time, with buildings looking considerably older and many businesses being decade-old family-run operations. That remained true for almost two decades despite the opening of the Sheung Wan Mass Transit Railway (MTR) station in 1988. But as Central became saturated and increasingly unaffordable, new businesses began to move west in recent years. And with the MTR’s West Island Line extension set to be completed by 2015, gentrification of the district has accelerated. How is it like? 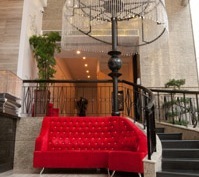 The lobby, although small, is quite posh with its big crystal lamp, red couch and modern art pieces. The décors of the rooms are very modern with neutral colour tones such as beige and grey. They all have flat-screen TVs, either 14-inch or 21-inch, depending on the room type. All but one of the rooms features only standing showers. Garden view rooms look out to the Hollywood Park, which is considerably nicer than looking at buildings close up. Transport: Sheung Wan MTR station is 15 minutes’ walk away. On Hollywood Road, you will have no problems getting a cab. There is a free shuttle service from 7am-7pm, dropping guests off at sister properties Lan Kwai Fong Hotel and The Mercer (see below), as well as Hong Kong Station for the Airport Express. How is it like? This incorporates Chinese elements into its interior. Chinese furnishing and a porcelain vase display mark the waiting area, and in the room you will find Chinese antique-style closet and doors, and jade plagues hanging by the bedsides, believed to help one sleep. All rooms have iPod docking and half of them have bathtubs, regardless of the room type. All of them have flat-screen TVs, some are connected to DVD players or equipped with ports to show photos or videos directly from your memory cards. Transport: You are only 10 minutes walk from the heart of Central. But as this hotel is a sister hotel of Central Park, you can take the same shuttle bus to the Hong Kong Station for the Airport Express, which is a little far if you are with luggage. Rates: City view rooms are HK$1,500 (US$193) and up and a harbour view suite starts from HK$4,000 (US$514). How big are they? The standard room is about 10sqm, and a junior suite goes up to about 25 sqm. How is it like? Although small, every one of the rooms is well equipped with a 29-inch LCD wide-screen TV, in-room safe, minibar and high-speed Internet access. There is a lot of contrasting of red and black, and the property’s signature floral motif is seen on the wall, as it is in the public areas. The junior suite is defined, other than the size, by a king-size bed, suede couches, black-and-white floral carpeting, a large impressionist painting, and more upscale bathroom amenities including bathrobes. Rates: Standard rooms start from HK$1,000 (US$128) and suites from HK$3,000 (US$385) per night. Limited numbers of channels on TV, with CNBC, ESPN and National Geographic but no CNN and BBC. How is it like? The décor throughout the hotel is swish and modern, with rooms showcasing luxury trimmings such as quilted leather headboards, Simmons mattresses, flatscreen TVs, DVD player, iPod/iPhone docking and Tarocco bathroom amenities from Italy. Transport: This property is only a few minutes’ walk away from the Sheung Wan MTR station and within walking distance from Central. How is it like? This hotel boasts “Victorian style”, in a modern interpretation. The elevators, lined with black glass and tiles, pleasantly smell of pomegranates. Baroque-style chairs, sheer lampshades, leather-lined walls and soft textured furnishing in the room provide a soothing environment. On some floors, the room number plate, doorbell and “do not disturb” light are quirkily designed to look like the top of a vintage suitcase.